How Well Do Fish Recover From Being Foul-Hooked? Question: It’s not uncommon on a fishing trip to have at least one foul hooked fish — some in the belly or back. Will these wounds kill the fish? Even with careful extraction, there is still a small hole in the fish’s body. Answer: I put this question to Gary Grossman — Distinguished Research Professor of Animal Ecology at the University of Georgia’s Warnell School of Forestry & Natural Resources University of Georgia — and he explained that mortality rates depend on the size of the wound and the amount of tissue damage. He notes that the hook removal process can be more damaging that the initial hooking. The wound from a small hook, carefully removed without stressing the fish, probably won’t kill a trout. But if you tear the tissue around the wound while the fish is bouncing around on stones for five minutes, you may cause either short- or long-term mortality via tissue damage, subsequent infection, and general stress. What about the dreaded bleeding from the gills, which most anglers see as a death sentence for a trout? Grossman says that, while bleeding from the gills is bad — because the gills are organs with major blood flow — a little bit of bleeding won’t automatically kill the fish. Studies have shown that hooking location effectively correlates to mortality. As you’d expect, fish that are hooked in the lip or jaw have the highest survival rates. Fish hooked in the esophagus or gills have the smallest chance of survival. Necropsies on such fish have shown that deep hooking often causes major internal damage to the heart, stomach, or liver. 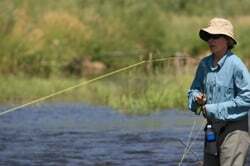 Ultimately, no matter where you hook a fish, you increase its chances of survival if you debarb your flies, keep the fish in the water, and remove the hook as carefully as possible. If it’s impossible to retrieve the hook without causing tissue damage, sacrifice the fly and snip the tippet.